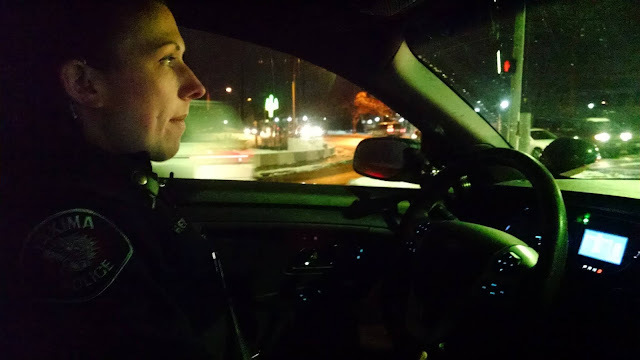 Lights and sirens were on as Officer Hailie Meyers and I sped down Nob Hill Boulevard on our way to a call. A caller had claimed there was a man with a gun in the backyard. Officer Meyers, along with other officers from the Yakima Police Department, were on their way to investigate and I had a front-row seat. My mind was racing with possible outcomes. A standoff. The person could go running down the road. A high-speed car chase. When we got to the scene, however, the person reporting the incident had changed the story and had simply thought that there had been the noise of someone cocking a gun in the caller’s backyard. Further investigation found that the caller had a history of mental illness and had been paranoid all week.